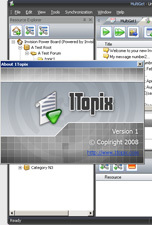 1TOPIX is a special utility that allows you to download the forums to your local machine for further reading. Offline forum reading. Our program allows to read info forum posts of your preferred contacts being disconnected to Internet at the moment. Posting with quotes and replying. You can create new messages and reply to the downloaded ones. Customizable forum info synchronization. Our forum aggregator can easily refresh and synchronize all information downloaded from forums. With just one click 1TOPIX program automatically synchronizes all of your information when online and updates data if required. Synchronization option can be performed manually. Advanced searching (forum, topic, message, user, ID). The advanced search gives you the power to specify exact terms for theme you are interested in. It lets you search by user profiles and forum categories. Multi- profiling mode support. Installed on one computer our effective tool can be used by several users that imply multi-profiling mode support. Authorized user can work with 1TOPIX determining which forums to download and what to include in favorite list. Every user has its own profile with password for access. Multi tab info viewing. After subscribing to forum categories you can download new posts and read them afterwards. In 1TOPIX program downloaded forum content is performed in multiple tabs view, enabling users to look through information organized in a convenient form. Favorite list creation. 1TOPIX gives you an opportunity to add your preferred forums, threads and topics to the favorite list. It allows setting the priority and downloading them firstly. User customizable favorite list helps you to organize, manage and process your primary information rapidly.